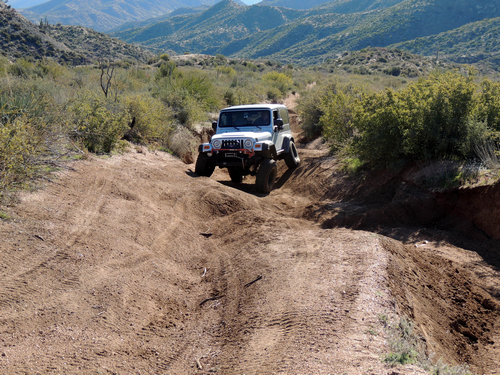 This Jeep trail takes you from Highway 87 to the east shore of Bartlett Lake. 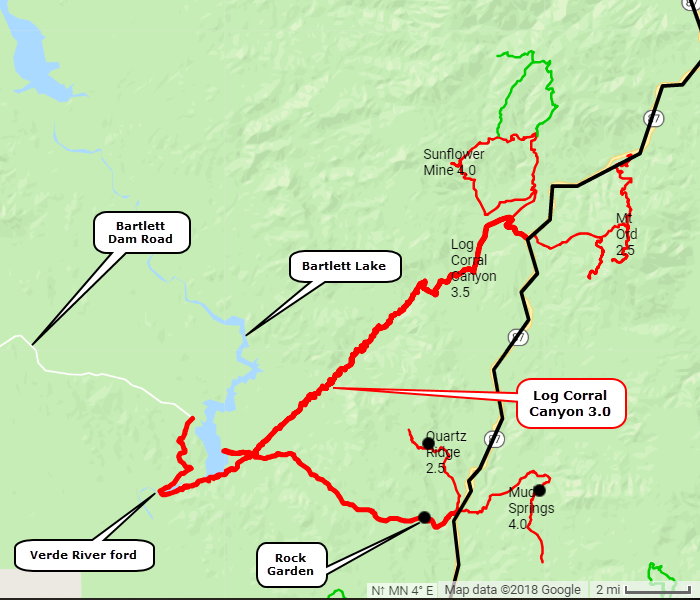 You can then turn southwest and ford the Verde River to Cave Creek or turn northeast and return to Highway 87 at Sunflower. Log Corral Canyon has one short section in the southeastern portion (called “The Rock Garden”) that is the most difficult part of the trail. Nice views of Bartlett Lake. 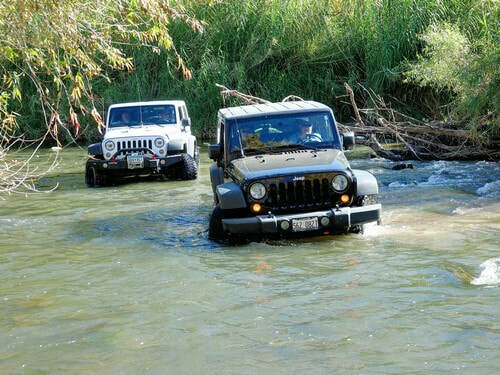 The trail goes to the shore of the lake and you can drive around much of it. The Rock Garden is only a short distance from Highway 87. If you get through this, the rest of the trail is easier. There are several additional obstacles that change year to year due to erosion. Some are 2.5 and some are a weak 3.0. 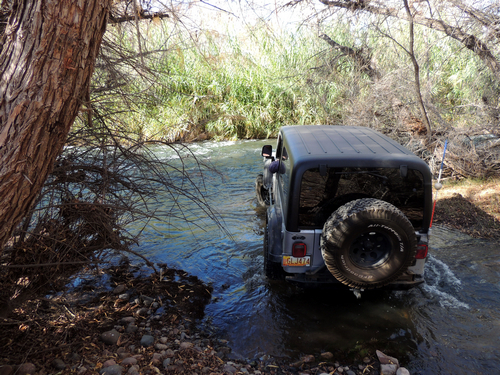 There are areas where the trail has eroded enough to require good articulation. 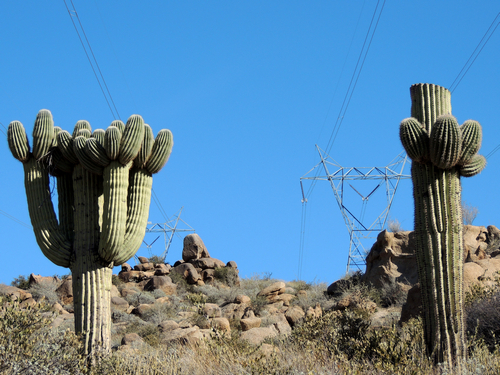 Saguaros under the power line were lopped off if they were deemed too close to the lines. Some of them sprouted numerous arms as they recovered. 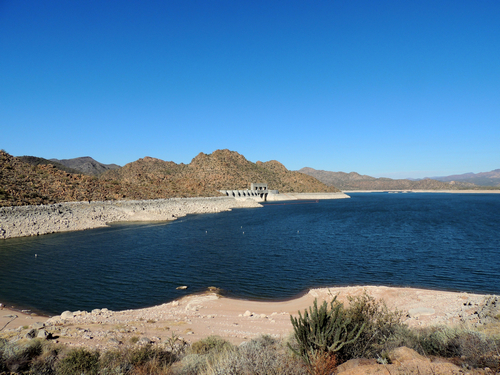 Make sure you drive to the shore of Bartlett Lake. 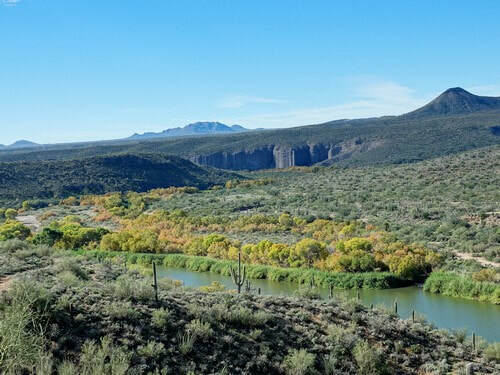 After that you have 3 options: northeast along the powerline to Sunflower, southwest to ford the Verde River to Cave Creek or simply return the way you came. Memory says the northeast run along the power line is long and boring. It has some nice views but is the same type of road for mile after mile. 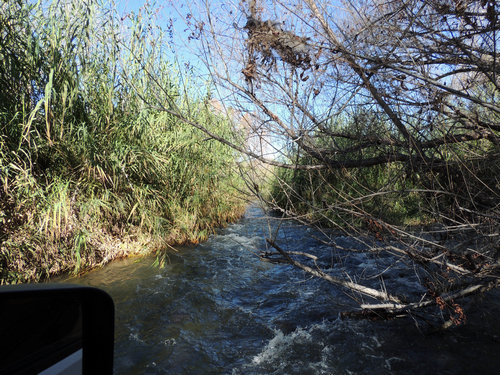 If the Verde River flow is too high most people will turn around and return directly to Highway 87. 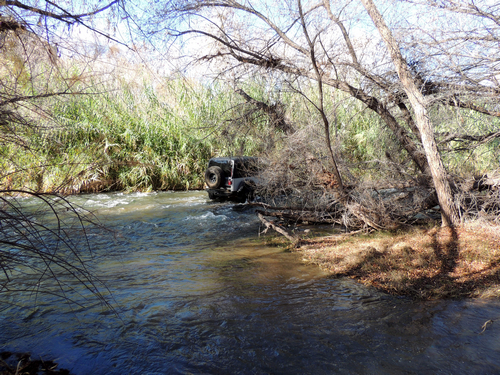 ​We forded the river when the USGS gauging station showed 165 cubic feet per second (cfs). The crossing could be dangerous when the flow is much higher than that. Enter the river in a shallow backwater, head toward one channel of the river and turn upstream. Head up the channel through a tunnel of trees, then turn left across the major channel to the exit point. We went straight from the left turn point to the exit point and were buoyant enough that we were being pushed sideways downstream. Next time we will stay more to the left, closer to the rips, where it is should be shallower. 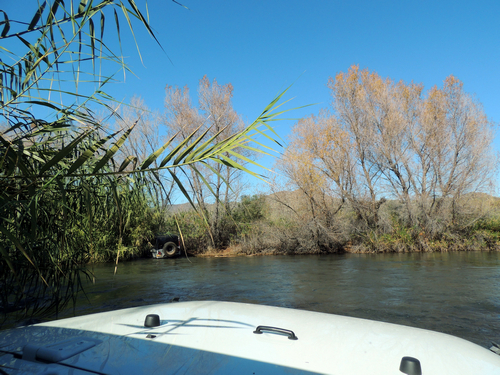 We forded the river another time at a flow of 101 cfs and it was much shallower. This photo is after making the left turn. This trail ends at the Bartlett Dam Road. 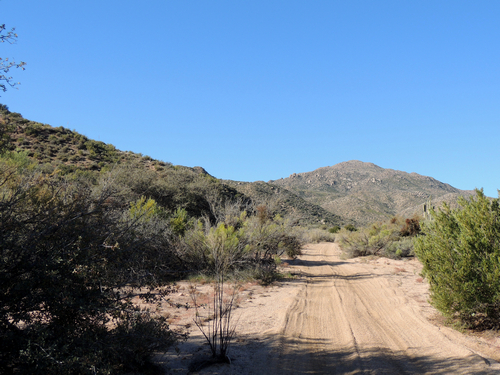 To exit take Bartlett Dam Road to Cave Creek Road, turn left and go to Pima Road. Turn left and follow Pima Road to Loop 101.